No stories are reprinted in both US and UK volumes. The UK reprints are only doing UK-exclusive stories. We now have the cover to Ruffolo's Sixshot book. And... I think I might skip the issue. I know I'll end up buying the TPB, so it's not like I'll be missing out on the story. It's really only severely lost on Rob Ruff and Pat Lee. Guido Guidi and EJ Su are rock solid on it, and Don Figueroa is on the ball 99% of the time. Ruffolo seems to have spent his time learning how to polish his coloring skills rather than decent perspective and proportions. I would hope, like Walky, that he's at least gotten his story direction act together. Yes, already posted. It already got my sufficiently frustrated reply. Why did Ruffolo have to be on the issue I looked forward to the most?! Edited by Thylacine2000, 07 September 2006 - 10:35 AM. Just... ugh. You'd think he'd at least use an original pose. No wonder some of the IDW forum people are swooning over how "G1 box art"-esque it looks. All we've seen is the cover and I already hate the thing. That's like a record. Yeah it's gonna be a cool issue even though Ruffolo is a crappy "artist". 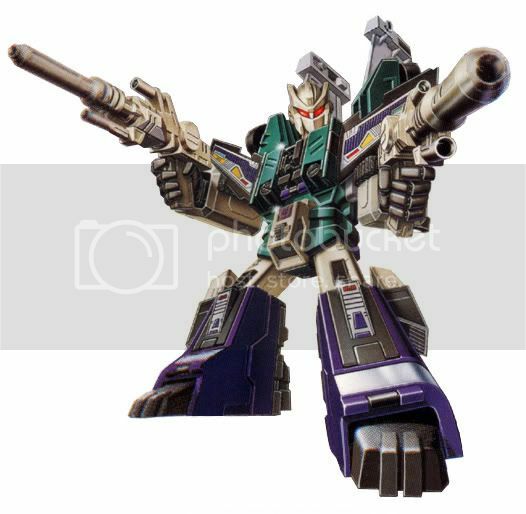 I'd like to see a 2nd wave of Decepticon infiltration unit in Nebulos, specifically the Head/Target masters. Maybe Furman could give a decent origin to the "binary bonding" process. It seems like a good possibility, since the jig was up when Thunderwing attacked Nebulos, perhaps giving them all new alt-modes to "fit in". I'm pretty sure they're all Cybertronian, Thrust certainally is. A "coincidence" of Nebulan and Cybryton vehicular technology would be lame. Maybe in a return adventure they'd not bother seeing there being no point and shift the story from desguise to something else. Nebulan vehicles in the comic were like WWII war machines with a WWIII edge. I don't remember much from the cartoon except for some kind of giant killer excavator which I think became Skorponok. Neither fiction had the Transformers adapting to their technologies for alt-modes and kept them as Cybertronian/Futurisitc Earth ('cept for the animal HMs). I'd assume that the Nebulan technology in IDW is very fuel-efficient, at least that's what I gather from that solar-powered plane thing. Like what Earth vehicles would be if we weren't reliant on fossil fuels. Yeah I'm big on a continuity with longevity, which is why I never got into anything after Beast Machines. Well, I did a little, but I don't miss it. I think some Evolutions stories could be cool if they were really interesting, like a story set in the 50s during the Cold War with hot rod Autobots (even Tracks as a C1 Corvette) and you could play up the whole "alien robot death machines" which seemed to be the epitomy of what people thought were going to kill them back in those days. Sputnik Transformer? Rock on! But on the other side, "Micromasters" was a part of the DW universe and was totally crappy so I skipped it and would've sooner bought "Hearts of Steel" had it come out then. jeez. this thrills me even more that the Hot Rod one is still Roche work. We haven't seen anything from Mark Bright yet, but after Shockwave I'd be very happy if Nick was doing all of the Spotlights. Yeah, especially since Rufollo is a-comin'. i hope Simon doesn't have to go online and explain what was SUPPOSED to be going on in the comic -- stuff that should've been clear through the art, but was butchered Micromasters-style. It's here as well -- I just don't really count covers as likely to be a good representation of the stuff inside. For some reason, that looks like a very low-res version with the lines rather uneven. There's lots more by him all over the web, though. And are you on colours for that one, BTW? That link says Wildman was going to do the art for Sixshot? Man oh man... this makes Ruffolo's return all the more frightening.